Yesterday we noticed that DRYS, a stock that has been in heavy decline since early this spring, had strung together a couple of decent sessions last week, so we tagged it for observation in our watchlist. It was a good thing that we pointed it out when we did, because the move it made yesterday made the previous sessions’ activity seem like small potatoes by comparison. The Greek shipper made one of the largest single session leaps in its history, and we were right there waiting to take advantage. From an early low of 13.60, the stock ran as high as 42.86 affording traders the chance to bank profits of up to 215% on the day. For a $10+ stock, that’s an absolutely incredible single-session move, and it came on well over two times the 3-month average volume. DRYS is now at its highest PPS since June, so congratulations to anyone who tagged along for the epic ride! The stock is gapping up past the $50 mark in the premarket, so we could stand to see even further increases from this juncture. Added Note: We’re seeing ripple effects throughout the shipping sector, which is as hot as we can ever remember it being. As a result, we’ll place a couple other related plays on watch as well with SALT and TOPS. We’ve had plenty of experience with NOK in the past, although we haven’t talked about it since May. We;re swinging back around this morning as we’ve noticed the establishment of a new 3-year lows on the stock. 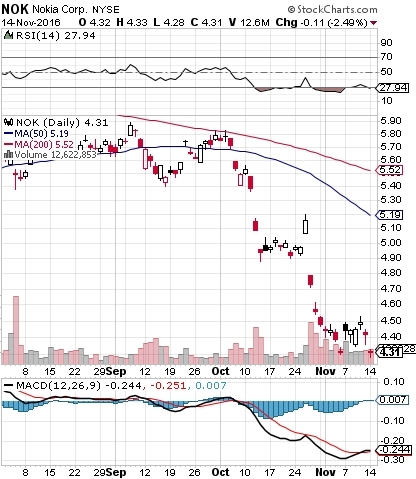 We want to place the stock on bottom-watch at the present time as the chart is beginning to crack into heavily oversold territory, with the addition of a bullish MACD cross which just occurred. As you can see below, the histogram is also set to flip to the upside. There’s potential for a good play on the stock itself, but of course, we’d also like to highlight a range of extended-term options ideas to use to our advantage if the eventual recovery plays out as we suspect it might. Our targets for the time being are going to be the NOK 01/20 $4 and $5 Calls. We have an interesting scenario unfolding with FVE that we’d like to point out as well. On Friday, a Form-4 was filed on behalf of an FVE insider outlining the purchase of just under $54M worth of common stock executed at 3.00 (>>View Filing). The interesting thing is, the PPS on FVE was in the mid-$2 range at the time, where it still remains. Such a vote of confidence by someone with inside knowledge of the company’s inner workings and future, is more than enough to sound the alarms for us. We’re going to immediately place FVE on watch and begin monitoring the stock for a reversal. Added Reminder: Cannabis stocks are continuing to come back after a period of consolidation, after several new states voted put either recreational or medical marijuana on the books. Despite having many other things to focus on in the current markets, we don’t want to let marijuana plays slip off of our radar for even a moment, as the next big leg up could be just around the corner.